Smart Bioscience has the expertise to synthesize peptides from 2 to 120 amino acids in efficient quantity and quality. The longer a peptide is the harder it is to synthesize. Conversely, very short sequences below 4 amino acids also require specific procedures to be synthesized. Finally, standard peptides may also be difficult to synthesize on some occasions depending on the proposed amino acid sequences. Predictive softwares exist that may help define synthesis strategies before a given project is initiated but they don’t provide absolute indications. Contrary to what is generally feared, hydrophobic peptides are not always more difficult to synthesize than other peptides. Nevertheless, they are generally difficult to purify and may require specific purification procedures. This is also the case for extremely hydrophilic peptides. Smart Bioscience has a solid expertise and adapted processes to produce both hydrophobic and hydrophilic peptides. Peptides are chemically synthesized by the sequential addition of amino acids from the C-terminus to the N-terminus. The yield of amino acid coupling is not 100%, so the final peptide will be obtained with numerous truncated versions, representing a significant part of the impurities. 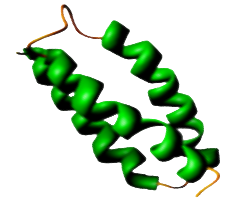 Another source of impurities is represented by partially-deprotected amino acids in which the side chains of some amino acids may still be protected by protecting groups. Basically, the more a sequence is long, the more the final peptide will contain impurities as well as various other parameters. Routinely, a normal 10 amino acid peptide gives a purity of 70% at the synthesis. Then, to obtain a greater purity rate, purification procedures will be required. The more the expected purity is high, the more the synthesis scale will have to be important, which explains the differences between prices. Ultra-pure peptides: Smart Bioscience can supply peptides with a purity rate >99% determined on an ultra high resolutive 2.6µ column. This approach ensures a ultra high accurate peptide purity. 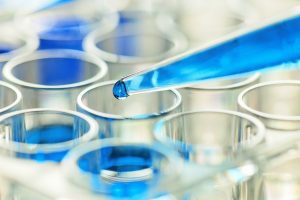 how to choose the peptide purity grade. Smart Bioscience offers laboratory research peptide synthesis scale, from milligram up to gram. Quantification of delivered peptides are given as Net Peptide Content (NPC) >90% rather than gross weight generally offered. 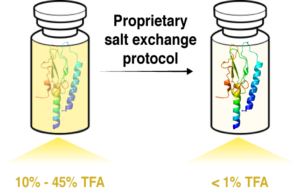 During the peptide synthesis process, peptides are in contact with TFA (trifluoroacetic acid) which forms salts and can rapidly take an important part of the final gross weight. Atmospheric water also increases the gross weight of the peptide. Our quantification methods give us a good estimation of the peptide material quantity rather than a gross weight. NPC >90% means that the given quantity contains more than 90% peptide material. We do not sell salts, we sell peptides! Smart Bioscience tests the solubility of delivered peptides and describes recommended conditions in each certificate of analysis. This service is included in the price.